Abstract Flavobacterium psychrophilum is the aetiological agent of bacterial coldwater disease (CWD), and this pathogen has large economic impacts on salmonid aquaculture worldwide. 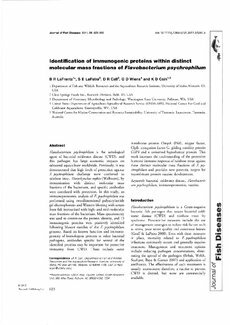 Previously, it was demonstrated that high levels of protection against F. psychrophilum challenge were conferred to rainbow trout, Oncorhynchus mykiss (Walbaum), by immunization with distinct molecular mass fractions of the bacterium, and specific antibodies were correlated with protection. In this study, an immunoproteomic analysis of F. psychrophilum was performed using two-dimensional polyacrylamide gel electrophoresis and Western blotting with serum from fish immunized with high- and mid-molecular mass fractions of the bacterium. Mass spectrometry was used to determine the protein identity, and 15 immunogenic proteins were positively identified following Mascot searches of the F. psychrophilum genome. Based on known function and immunogenicity of homologous proteins in other bacterial pathogens, antibodies specific for several of the identified proteins may be important for protective immunity from CWD. These include outer membrane protein OmpA (P60), trigger factor, ClpB, elongation factor G, gliding motility protein GldN and a conserved hypothetical protein. This work increases the understanding of the protective humoral immune response of rainbow trout against these distinct molecular mass fractions of F. psychrophilum and provides new potential targets for recombinant protein vaccine development. Keywords: bacterial coldwater disease, Flavobacterium psychrophilum, immunoproteomic, vaccine. Introduction Flavobacterium psychrophilum is a Gram-negative bacterial fish pathogen that causes bacterial coldwater disease (CWD) and rainbow trout fry syndrome. Preventative measures include the use of management strategies to reduce risk factors such as stress, poor water quality and cutaneous lesions (Groff & LaPatra 2000). Even with these measures in place, mortality related to F. psychrophilum infections commonly occurs and generally requires treatment. Management and treatment options include reducing pathogen concentrations, eliminating the spread of the pathogen (Bebak, Welch, Starliper, Baya & Garner 2007) and application of antibiotics. The effectiveness of such treatments is usually inconsistent; therefore, a vaccine to prevent CWD is desired, but none are commercially available. Journal of Fish Diseases 2011, 34, 823–830 doi:10.1111/j.1365-2761.2011.01297.x Correspondence Dr K Cain, Department of Fish and Wildlife Resources and the Aquaculture Research Institute, University of Idaho, PO Box 441136, Moscow, ID 83844-1136, USA (e-mail: kcain@uidaho.edu) *Present address: USDA-ARS, Aquatic Animal Health Research Unit, 990 Wire Road, Auburn, AL 36832-4352, USA.